With Hasbro pursuing entertainment venues more aggressively in recent memory(like the upcoming HUB venture with Discovery Channel), it might not be a surprise to know that they are planning a movie called Hasbro Factory. It seems like a combination of popular movie titles “Night in the Museum” and “Toy Story” only with Hasbro’s toys. What better way to exploit all of the Hasbro miscellanea than to rip off Night of the Museum? We’ve learned exclusively, via The Hollywood Cog, that that’s exactly what Paramount and Hasbro are doing: Developing a movie called Hasbro Factory, which is being described as Night at the Museum inside a Hasbro Factory, which also makes it something akin to Toy Story with only Hasbro Toys. The details we have are scant — it’s out to writers at the moment. We don’t even know which toys will make it into the final movie, or if the board games on which other movies are being based will make crossover appearances, but in either respect, it’s really silly to be talking about the possibility of the Battleship Board Game making an appearance in a movie with the Play-Doh man. But that’s the state we’re in right now. 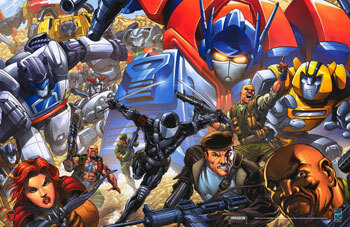 Hasbro’s production company additionally has a number of other projects in development, including movies based on Battleship, Micronauts, Risk, Stretch Armstrong, Ouija, Candy Land and Clue. (Two other products, M.A.S.K. and Jem, we know also have separate movies in the works). Hasbro hasn’t forgotten about MASK, anyone remember the GI Joe 25th Anniversary Matt Trakker figure? Which toylines and characters would you like to see in Hasbro Factory? Do you think this movie has a lot of potential? Sounds like it could be kind of cool. I'm more interested in the MASK news. What's going on there? I really hope Hasbro isn't spreading themselves too thin. With massive reworkings of numerous franchises in the works, launching their own channel, and dealing with a myriad of different movie licenses, I can't help but think they are simply running with every idea. Massive profits can blind companies to bad ideas, and this has all the makings of a really bad idea. Agreed. I think the action figure lines can make for good movies, like Micronauts and MASK, over stuff like Stretch Armstrong, Risk, Monopoly, a magic 8 ball(not sure if this one is Hasbro), and Battleship. As for MASK news Megaprime, I'm not sure either, this is one of the 1st times I've heard about a MASK movie. Glad to know Hasbro isn't overlooking that license. Yeah, I'm a little scared by this. Some properties just don't translate into other forms of media. I mean, unless the Monopoly movie is something akin to Wall Street, I don't think it'll work. I guess Battleship could be done like a sequel to The Final Countdown. But I will say I'm happy that M.A.S.K. might have a future. Even if it meant just a revival line using G.I.Joe molds, I'd go for it. And is it sad that Sparkhunter's synopsis is probably better than what we'll actually get? I'm more interested in the MASK news. ...this has all the makings of a really bad idea. 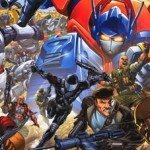 Even if it meant just a revival line using G.I.Joe molds, I'd go for it. A Risk movie would be cool. And the Battleship teaser trailer looked pretty cool.